As we all know George Clooney is a man of many talents. He has won Oscars for acting (Syriana) and producing (Argo) and has been nominated for his writing and directing efforts (Good Night, and Good Luck). These are just some of the high caliber credits under his belt. Plus, he is pretty darn good to look at on any given day of the week. 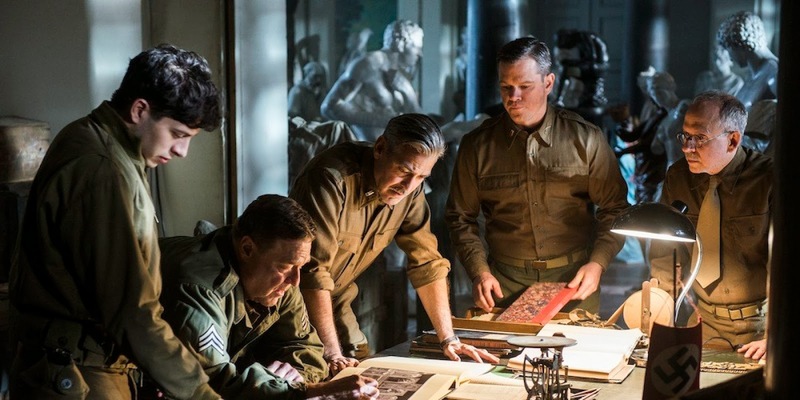 His latest project, The Monuments Men, has him wearing many hats again as he acts, directs, writes, and produces the film. He enlisted the help of an all-star cast with Cate Blanchett, Bill Murray, Hugh Bonneville, Jean Dujardin, Bob Balaban, John Goodman, and his good pal Matt Damon. This all sounds like a winning combination for this little known lesson in art history. 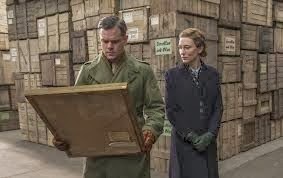 Lieutenant Frank Stokes (Clooney) has been granted permission from President Roosevelt to form a troop of men to rescue precious buildings, monuments, and art that could be lost and damaged in the war or stolen by Hitler’s men for the Fuhrer museum. 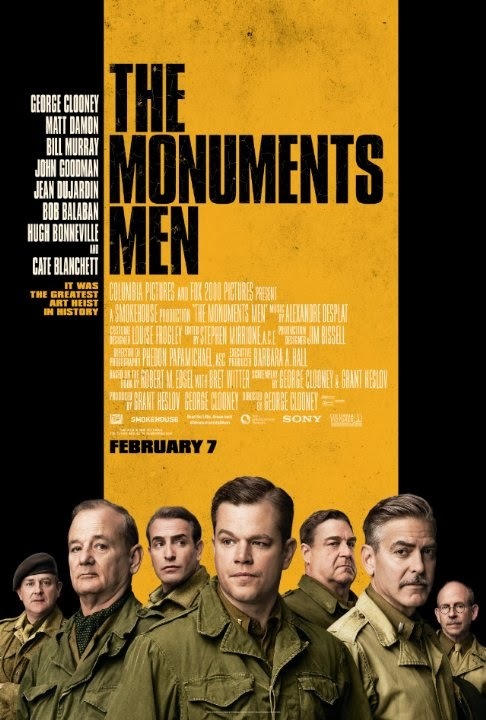 The group known as “The Monuments Men” consists of various architects, art historians, and curators who are not fit for war by any means. The physical aspects of boot camp pose a challenge for some of the men. Their experience with firing a gun and knowing how to survive in the battlefield is minimal at best. Stokes and his men haven’t a clue as to where the Nazi party is keeping their stolen goods, so they split off into pairs to track down the various pieces and collections that have gone missing. 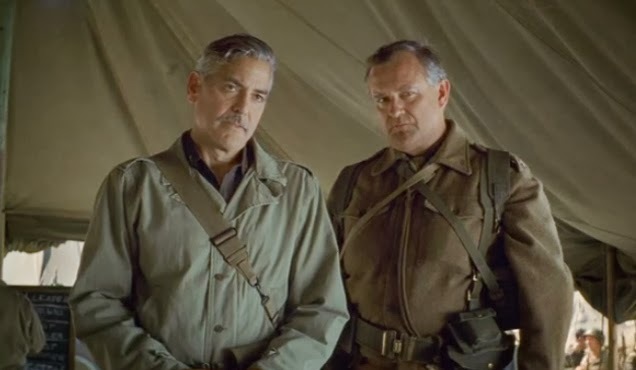 Like I mentioned previously, Clooney co-wrote and produced the film with his partner Grant Heslov. I think Clooney may have bitten off more than he can chew here. There is a lack of specificity that plays throughout the film that is quite apparent early on. They have this general layout for the story but they don’t infuse it with anything meaty to grab onto. The group of guys are written quite generic at best and are not given anything juicy for the actors to play with regarding character development. Clooney casts these great character actors that are probably all his friends, but no one is playing outside their comfort zone. Yes, they each have fun little moments here and there. Bill Murray has a touching scene listening to a recording of “Have Yourself a Merry Little Christmas”, but that’s just one scene. Are we supposed to take away that by casting all of these comedic actors that can also do drama that it’s funny and ironic that they are the ones going into war to save the art? Clooney and Heslov didn’t write the comedy strong enough to make it that apparent. Cate Blanchett is thrown into the mix but her beginning scenes feel a bit off kilter as well. She plays a French art curator that is also working to save and protect certain pieces from being captured by the Nazis. Her scenes seem to flow better once Matt Damon’s character enters the picture. There is a fun joke about the Damon character not speaking French properly. Again, it’s a decent gag like some others, but the thread that runs between them is not very strong or supportive. A really great musical score composed for any given movie can elevate the story by bringing out the suspense and tension in any given scene. Sometimes if a score is mediocre it fades into the background and you don’t notice it. I normally love the work of Alexandre Desplat (Philomena, The Curious Case of Benjamin Button). There can be these beautiful and melodic choices in his work that carry us through certain scenes. 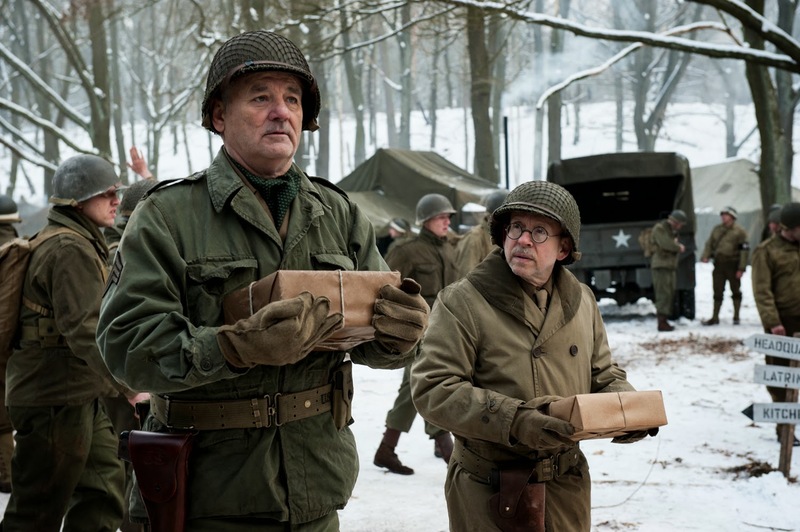 His score for The Monuments Men is quite jarring. It often times doesn’t match the tone of the film or of the action going on in each scene. I partly blame Clooney and Heslov for not having a clear voice and structure in the film. Desplat’s score makes that even more apparent. It often feels like it is used as a crutch to carry scenes along and cover transitions where dialogue seems to be lacking. The film was originally set to be released in December 2013. It was naturally thought of as being a heavy Oscar contender with Clooney and Heslov attached to it. After news broke that the release was being pushed to February, it was a clear sign that the film was in rough shape. The “official” wording was that it wouldn’t be ready in time. I think it’s evident that the studio knew that there was no way it could compete with the other films released around that time. Clooney brings forth an important story about the importance of art in our culture and how tragic it would have been to have lost all of these pieces. I am by no means an art historian, but I was able to stay engaged as someone that has been to his fair share of art museums. The bigger problem is that they don’t really know how to tell this story with a precise and distinct vision to it. The writing is a general wash without any careful eye on character choices or what tone they want the film to have. My husband loves history and has been reading about Truman’s life recently, so he was able to connect more dots and have a better understanding of the war details that I missed out on. I wouldn’t consider myself bored by the movie as the basic premise is intriguing. There are some nice moments here and there, but they don’t add up to a great movie. Is it worth your trip to the movies? No. Clooney, Damon, Murray, and Blanchett have far better movies out there to chose from. On the other hand, you may find the film enlightening if you are a big history buff.